Renowned aluminium specialists, CDW Systems have extended their comprehensive range with the addition of CS 77, the eye-catching flush residential door system from Reynaers. Designed to help installers capitalise on the incredible demand for both aluminium and smooth, flush aesthetics, the CS 77 system uniquely finishes flush with the frame on both the interior and exterior of the door. Available in three distinct designs, CS 77 expertly complements the full Reynaers suite, allowing customers to offer discerning homeowners the complete aluminium package. “Whilst there’s so much we can’t predict about the next 12 months, what we can say with real certainty is that aluminium will continue to be a major growth area and that demand for flush products will only rise further. With that in mind, we are delighted to expand our range with CS 77 and present an exciting opportunity for our customers nationwide,” comments Richard Smith, Technical Director at CDW Systems. In addition to uncompromised flush aesthetics, the CS 77 residential door delivers excellent levels of security, weather resistance and thermal insulation. The new door system is available in any RAL colour with dual-colour options and can be ordered with a variety of threshold options to meet any residential requirement. The new residential door system is one of many new additions made to the CDW line-up over the past 12 months. 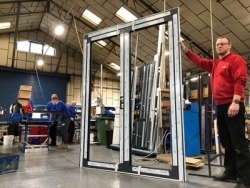 The Gloucester-based firm also introduced the new VS 600 from Smart Systems, a popular vertical sliding window which combines the aesthetics and operation of a traditional sash window with the thermal performance and durability of cutting-edge aluminium.